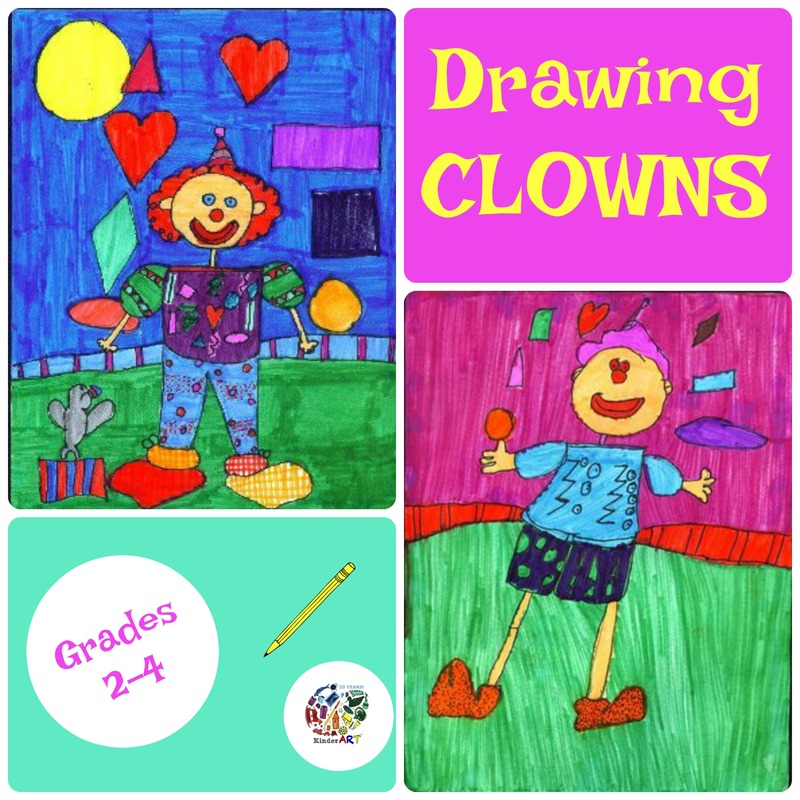 How to Draw Clowns Lesson Plan for Grade 2 from KinderArt.com. This particular activity followed a series of lessons in the Monart Drawing Method. 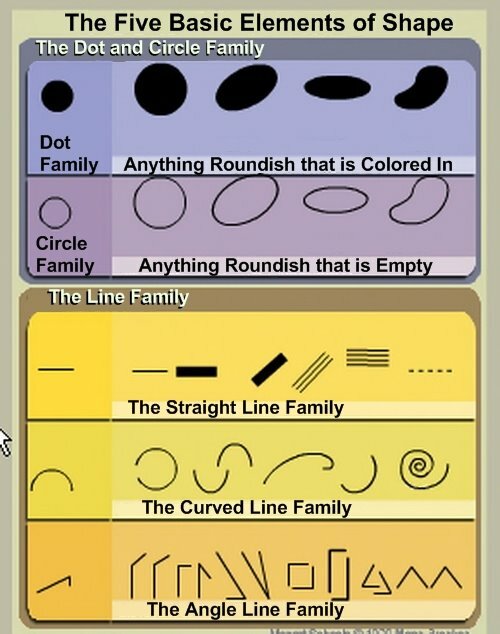 As the lesson progresses, I continually refer to the Monart basic shape families; Lines, Dots, and Circles. I demonstrate how to draw the clown (again, referring to the names of the shapes or lines I am using). One can use either an overhead projector, or a digital projector. I’ve used both. I have found over the years that many students need that extra help when drawing. They either draw the images too small or too skinny or in some cases, say they can’t draw at all. I model how to draw the clown but that isn’t always necessary. However, I model only the basic parts (head, body, arms, and legs (shoes too)) and have them choose how to draw the hair, hat type (or no hat) and designs on the body. Some kids venture out on their own, others copy the details of the model. Just as a side note, the technique for drawing the clown feet come from Mark Kistler’s Draw Squad method. After students complete their drawing (using pencil) I then have them outline their work with black marker followed by coloring with markers. 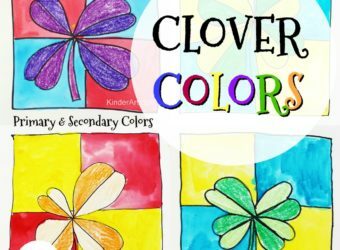 The basic rule for coloring is that the students are to use all the colors on the color wheel. There can be no white left on the paper. I teach the kids that a marker is much like a paint brush. 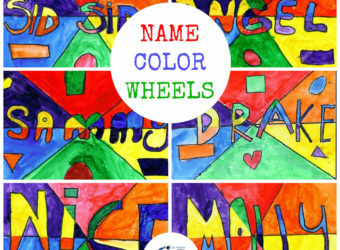 All the color is in the tip and that the students simply “paints” the color onto the paper. BUT, they are to keep their lines going in the same direction (for each individual section or shape). For example, when coloring the ground that the clown is standing on, choose either vertical or horizontal lines and lay one line of color down and then the next, and then the next, and so on. 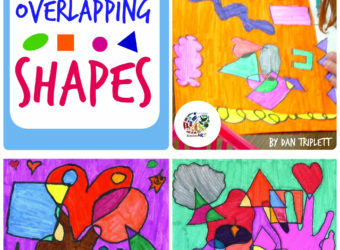 For shapes, outline the shape first, then choose the direction to color, and lay down one line at a time (don’t go back and forth like one would with a color crayon or color pencil). Start at the top of the area to be colored, draw a line of color to the bottom, then start that exact process over again). 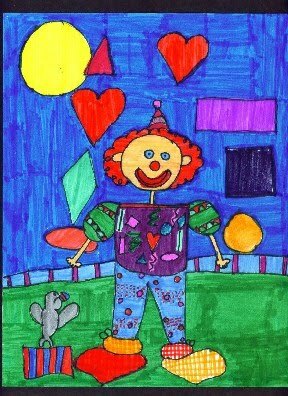 You can see the technique in each of the clown drawings. For round objects I have the kids first outline the shape, and then color in a spiral following the round shape. I hope this explanation makes sense. After the pictures are completed, I have the students mount them and then they are displayed either in their rooms or outside the rooms. 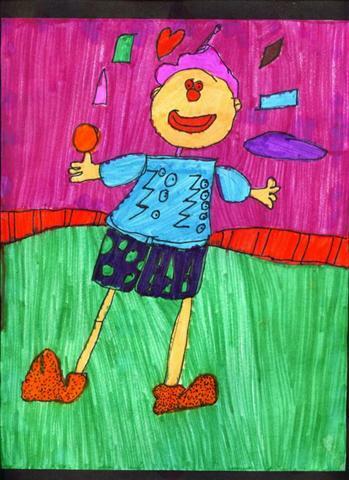 In some activities of a similar kind, I have allowed for the backgrounds to be colored using colored pencils or crayons. 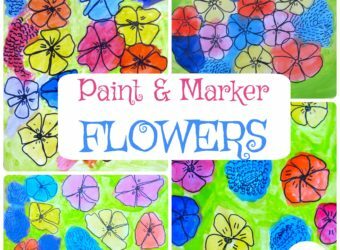 Details are all colored in markers (using the above mentioned method) and backgrounds can be colored with crayon or pencils. It’s a nice light background contrasted against the darker color of the markers. What I like about activities like this one is that they gives me an opportunity to talk about design, overlapping, background, details, positioning, etc. Concepts about line and shape can be reinforced and principles such as repetition, patterning, balance, etc can also be introduced.